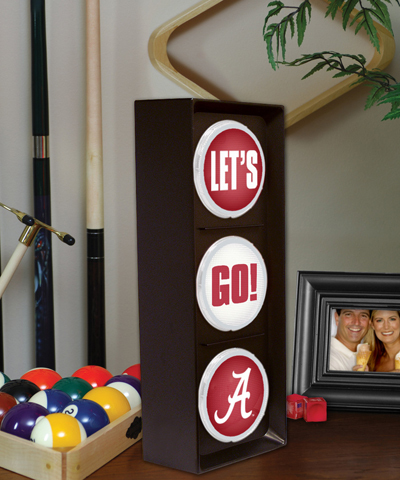 Show your team spirit with illuminating light with this officially licensed Alabama Crimson Tide flashing “Let’s Go Light” from The Memory Company®. No room is complete without this bold flashing traffic light featuring team graphics. This versatile light has rotating lenses so it can hang on a wall or be placed on a desk, mantle or shelf. Light follows a traditional traffic light pattern, lighting up “Let’s” then “Go” then “Team Graphic”. This light plugs into the wall using a standard outlet. Measures 16” Tall by 6” Wide.